You can use the fonts any way you want (Personal use, Commercial use, or whatever). Timbra Sans may be embedded into PDF-Files and websites. If you have a font related site and would like to offer my fonts on your site, I would be very happy. Please get in contact with me first to set things up. You may not sell or distribute Timbra Sans or alter them in any way without asking me first. Original or future modified versions of Timbra Sans may not be bundled, redistributed and/or sold by any means without permission by me. When production credits are listed please include me. I love to see my fonts used in cool projects and think as Timbra Sans may have made your final piece what it is I could get a credit in these production notes. Please send a sample if you can and you’ll make my day! Timbra Sans has been designed with great care and effort. Nontheless will I, the designer of the font(s), in no event be liable to you for any consequential or incidental damages, including any lost revenue, profits, goodwill or savings, or for any claim by any third party. And now, have fun using Timbra Sans! 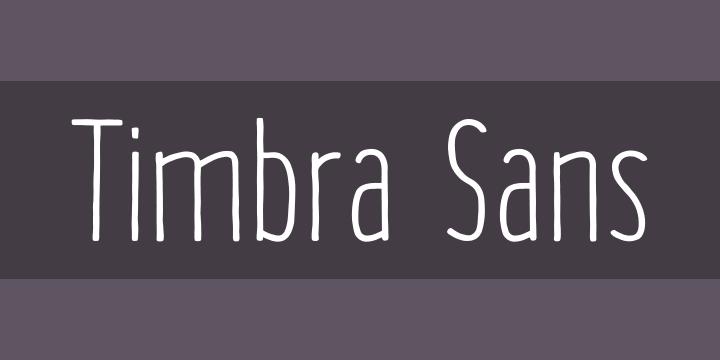 Timbra Sans is a handmade condensed sans-serif coming in two weights. The Fonts include 387 glyphs and support Basic Latin, Latin-1 Supplement and Latin-Extended A. In addition to that there are ligatures as well as open-type fractions.